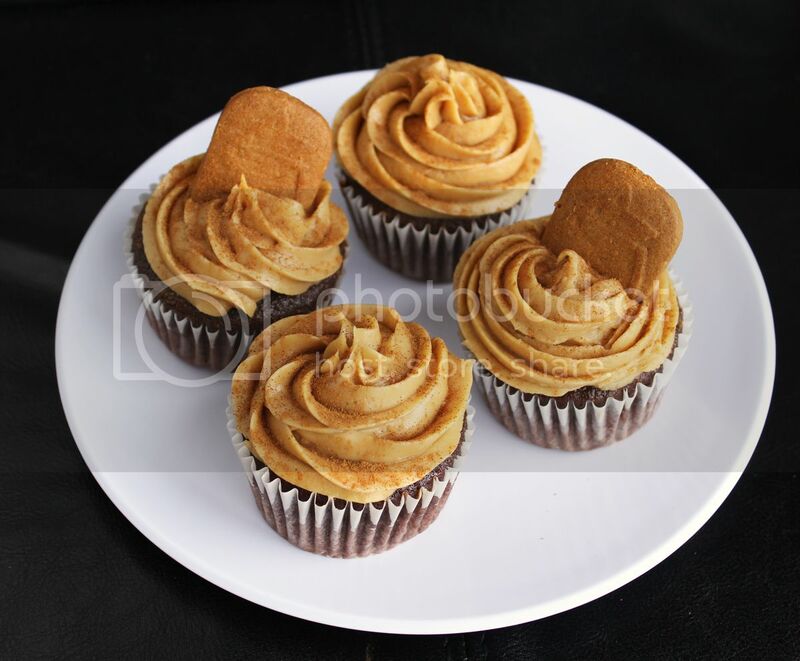 So this is the first Biscoff recipe on my blog, and I’m sure most of you are probably thinking that I’m the last one to the Biscoff party, which started almost two years ago. The thing is, Biscoff hasn’t really become as popular here in Canada as it has in the United States (or Europe, I assume, as that’s where it originated). 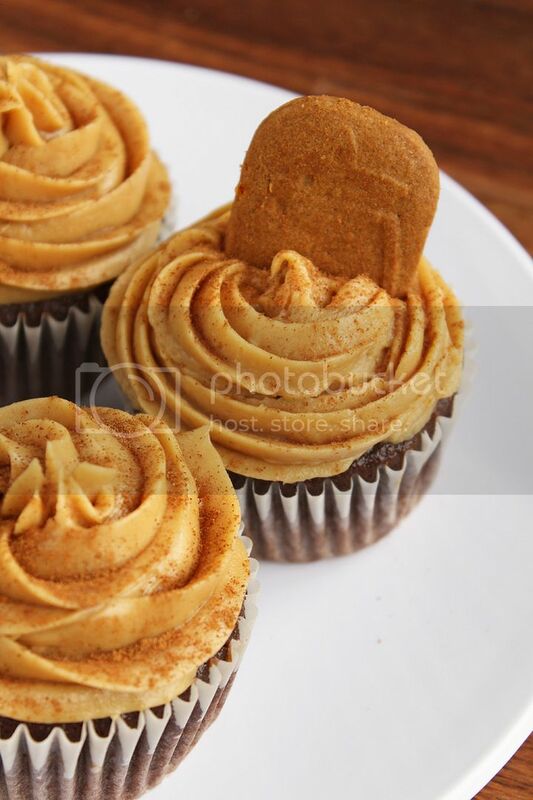 In fact, when I sent these cupcakes to work with my boyfriend, he had to call me to ask me again what they were called because he had never heard of Biscoff, and apparently nobody at his work had either. 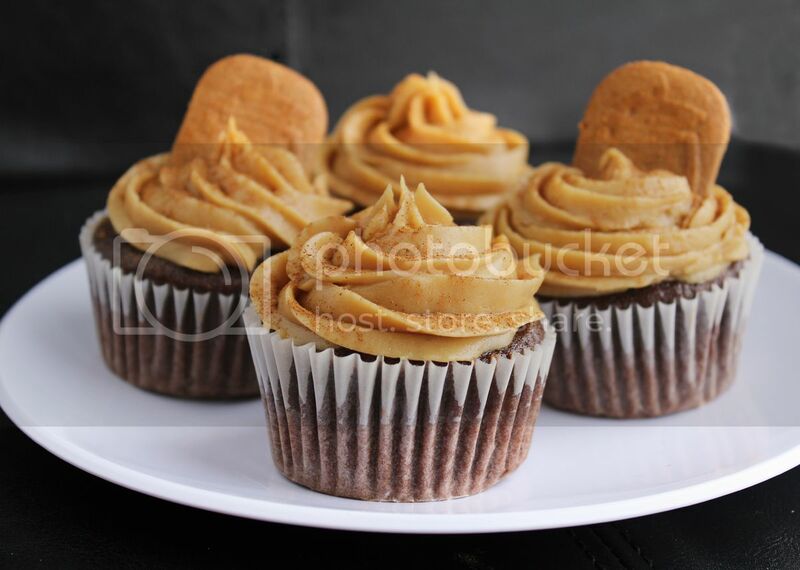 And when I wrote about these cupcakes on Facebook, the first comment I got was asking me what Biscoff is. Biscoff cookies (“Europe’s favourite cookie with coffee”, according to their website), also known as Speculoos, are a crisp little Belgian cookie with a cinnamon/caramel/gingersnap-like flavour. They originated in Europe but grew in popularity around the world when airlines like Delta started handing them out on flights. A few years ago, the cookies were turned into a creamy spread with a consistency of peanut butter and taste of Biscoff/speculoos cookies. The main ingredient in the spread is cookies, which is why it’s also referred to as cookie butter. I think a lot of people eat the spread as they would peanut butter, such as on toast or as a dip for apples, but it’s also become really popular for use in baking. 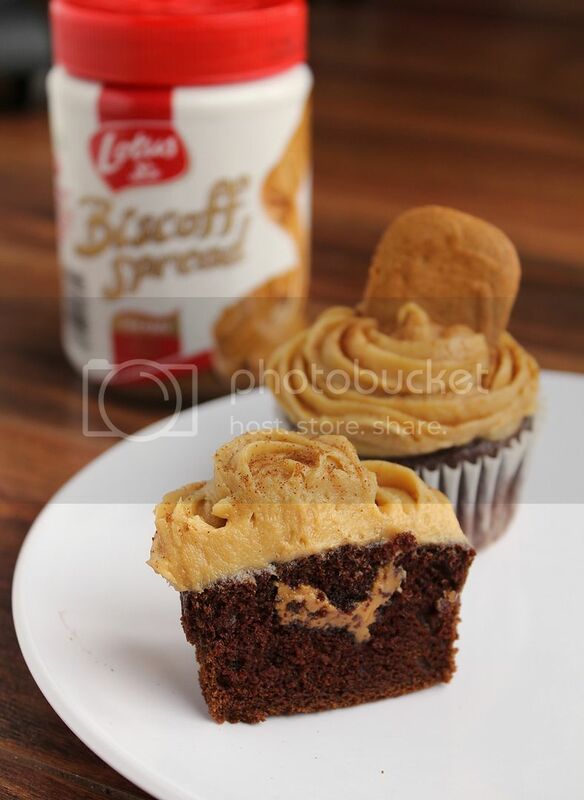 There’s a nice little slideshow on Huffington Post of some of the ways you can use Biscoff spread! 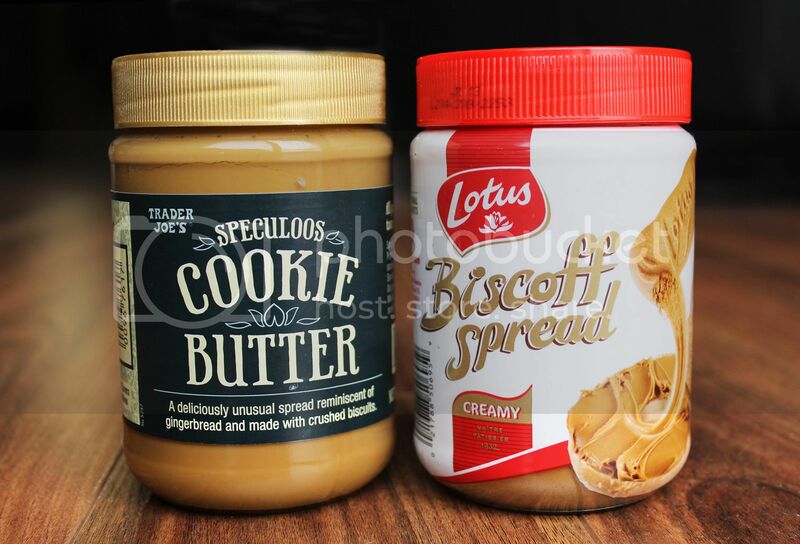 While it’s now available in many grocery stores in the United States, including Trader Joe’s, which has its own version called Speculoos Cookie Butter (pictured above), it hasn’t really appeared much in Canada yet, which is why most of my friends haven’t heard of it. I buy it when I go on trips to the US, but if you don’t live anywhere near the States (or Europe), I’d recommend looking in European grocery stores – I’ve actually spotted Biscoff at an Italian supermarket in Waterloo, Ontario, so it is out there! I had a hard time choosing what to make for my first experiment with Biscoff. I’ve never really been a big fan of cupcakes, but I made some red velvet cupcakes on Valentine’s Day (which I posted about on Facebook, if you’re interested) and they turned out so well that they changed my mind about cupcakes. Plus they are so fun to decorate! I was so happy with how these turned out! The Biscoff cream cheese frosting was my favourite part and the chocolate cupcake was the perfect complement to it, plus I loved the little surprise of Biscoff in the center! I ate two right after I made them then had to send the rest away to be shared before I got carried away, and I’m told they were very well received at work, even though most people probably didn’t know what they were eating! I still have a jar and a half of Biscoff to use up, so now that I’ve introduced you guys to it, expect to see a few more recipes here in the near future! And if you have a favourite Biscoff recipe or way to use it, please feel free to share in the comments, I’d love to hear your ideas! Preheat oven to 350°F. 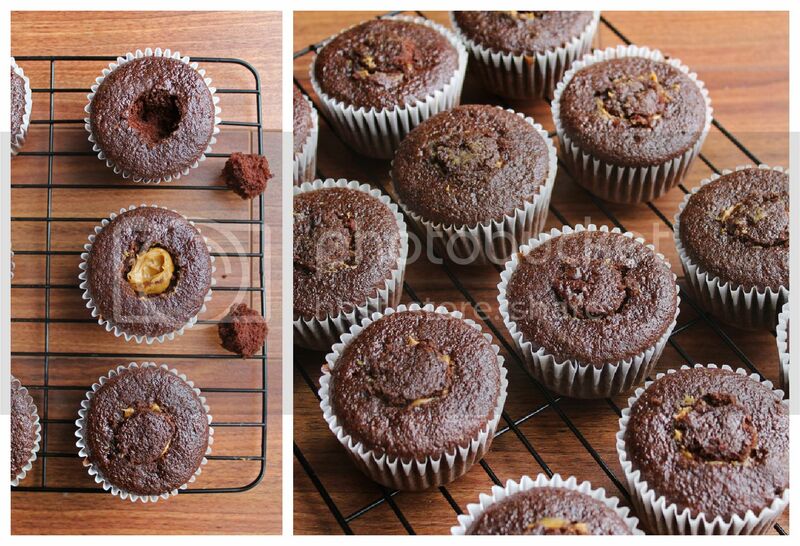 Line a muffin tin with paper liners and spray with non-stick spray. In a large bowl, whisk together the flour, sugar, cocoa powder, baking soda, baking powder, salt, and cinnamon until well combined. In a separate bowl, whisk the egg, milk, oil, and vanilla extract until smooth. Add the wet ingredients to the dry ingredients and mix well until smooth. Stir in the coffee; batter will be thin. Use a measuring cup to pour batter into liners, filling them only 2/3 full. Bake in preheated oven for 22-25 minutes, until a toothpick inserted in the middle comes out clean. Transfer to a wire rack and let cool completely. Meanwhile, prepare frosting. Beat the cream cheese and Biscoff together with an electric mixer until smooth, about 2 minutes. Slowly add the icing sugar and mix on low speed until combined. Mix in the salt and vanilla. Once cupcakes have cooled, use a sharp knife to cut a small cone out of the top of the cupcake. 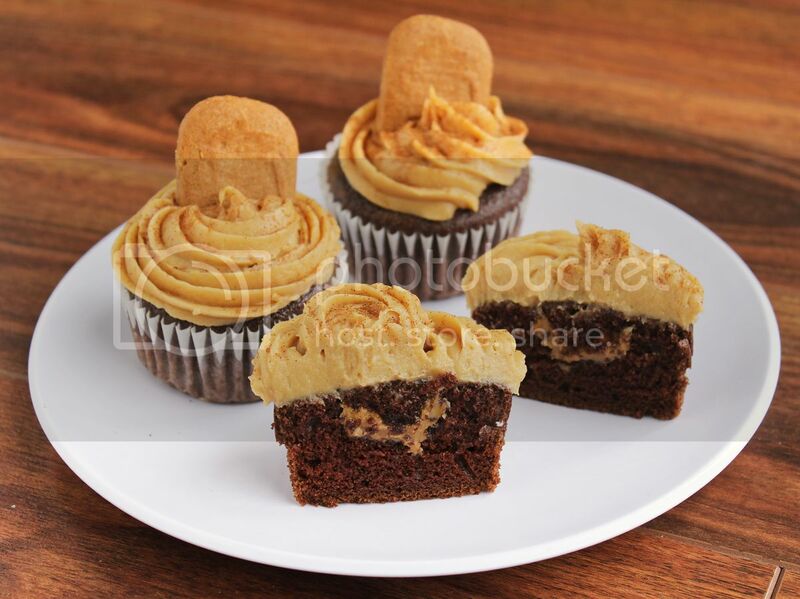 Remove the top and fill with about 1 teaspoon of Biscoff spread. 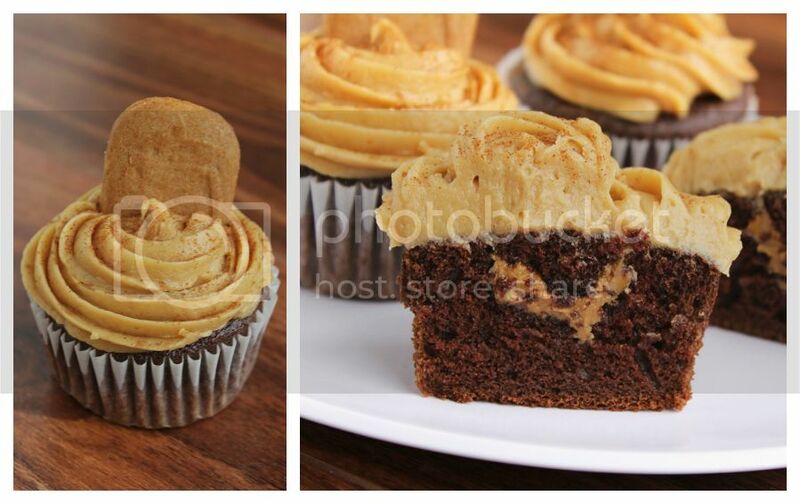 Replace the top and push down to hide the biscoff inside the cupcake and create a flat surface on the top of the cupcake. (see here for pictures of the cone filling method). Transfer cream cheese frosting to a piping bag (I fitted mine with a Wilton 1M tip) and frost cupcakes. I decorated mine with Biscoff/Speculoos cookies and a dusting of cinnamon.